Merion Announces Exit Through a Sale of Portfolio Company to Goldman, Sachs & Co.
We are pleased to announce a successful exit from AFS Technologies through a sale to an affiliate of Goldman, Sachs & Co. In 2006, Merion provided subordinated debt and equity to provide funding for an acquisition and additional working capital. 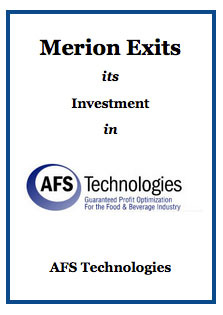 During Merion’s investment, AFS grew revenues over 6x and operating income over 10x.